Aside from nature tourism, Belitung Island holds other potentials. For instance, you can enjoy religious tourism. Some districts become the home of fabulous monasteries, after all. In Gantung District, there is Sun Li San Temple. It is situated in Parit Tebu Village. A unique part of the monastery is its location. It lies in a highland. Once you have arrived at the monastery, you can also witness beautiful views from above. However, your car can only reach the parking area. For the rest of the trip, you should climb the stairs. Are you ready? The most challenging part of Sun Li San Temple is the location. Visitors should spend some time for trekking. Once you reach the parking lot, you must walk to the monastery. It is indeed tiring. However, it is going to be a rewarding journey. In order to prevent tiredness, you should carry some refreshments. Bottled water is a must! The terrain is definitely comforting. You can see several trees and grassy field. Not to mention the wind is quite breezy. From the parking area, you must walk to Sun Li San Temple. It is situated on the hill, so you must climb some stairs. This is part of your adventure, after all. No worries. The stairs come in a good condition. If you get tired, you can rest for a while. Just turn around and you can see breathtaking views from above. The land is visible along with trees and majestic landscape. On top of that, there are several benches nearby. You can rest in that location and continue your climbing later. Along the way to Sun Li San Temple, you may expect some visitors. Most of them are couples. They want to enjoy a romantic view from the temple. The best spot to hang out is in the resting area. It is located in the lower part of the monastery. Once you reach the top, you can witness a majestic structure. In the left part, you can see a pendopo. The roof of Sun Li San Temple has the shape of a pagoda. Though, it only features two levels. Also, it doesn’t include dragon ornaments. 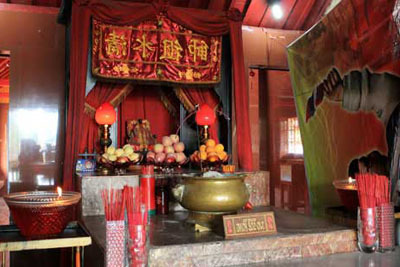 The main altar of Sun Li San Temple is an open room. There is no door at all. Near to it, there is a small pagoda. Visitors use it to burn paper prayers. A unique atmosphere becomes a feature of the monastery. You can feel the gusty wind in there. No worries. You will get used to it. The main attraction of the temple is the Kwam Im Statue. She sits on a lotus and is situated between two other statues. More people come to this monastery due to its holiness. Many people have proven that their prayers have been granted there. What do you think? From Tanjung Pandan, you must head to Gantung District. The distance is 83 km. That means it takes about 1 hour and 50 minutes. A rented car is recommended. The route is easy, actually. You only need to follow Badau-Simpang Ranggiang Street. Once you have arrived in Gantung, it is time to head to Parit Tebu Village. From here, the trip only takes a few minutes. The monastery is visible from afar.